When you're expecting, some of the foods considered safe for adults can be dangerous to your growing baby. If you have a barbecue coming up, you may wonder if charcoal-cooked foods are on the don't-eat list. Providing that the foods are thoroughly cooked, you can go ahead and enjoy the grilled goodies. You may want to stay away from the charcoal fumes, however, to avoid inhaling harmful chemicals. Always speak to your physician, however, to ensure that charcoal-cooked foods are safe for you and your unborn baby. Taking steps before you fire up the charcoal grill and while cooking are vital to protecting your baby's health. This means storing raw meat in the refrigerator, then removing it just before you cook it. Doing so helps to prevent the likelihood that bacteria could grow on meat. If your meat was frozen, thawing it properly in the refrigerator is important to ensuring that the meat can be thoroughly cooked. When you're cooking with charcoal, refrain from putting the meat on the grill until the charcoals have a glowing red, yet grey powdery surface, which signals that it's time to cook. Your meat should be completely cooked through -- no pink present in the middle. Even if your meat is charred on the outside, this isn't an indicator that your meat is evenly cooked. If you're cooking pork or lamb, you're at increased risk for an infection called toxoplasmosis. While this parasite would normally cause flu-like symptoms, the parasite is linked with causing brain damage in your baby and potential miscarriage. Provided these meats are thoroughly cooked, you can safely eat them. However, you may wish to take special precautions when eating barbecued pork or lamb. While eating thoroughly cooked food on a charcoal grill shouldn't harm you or your baby, it's important to avoid fumes that come from a charcoal grill. 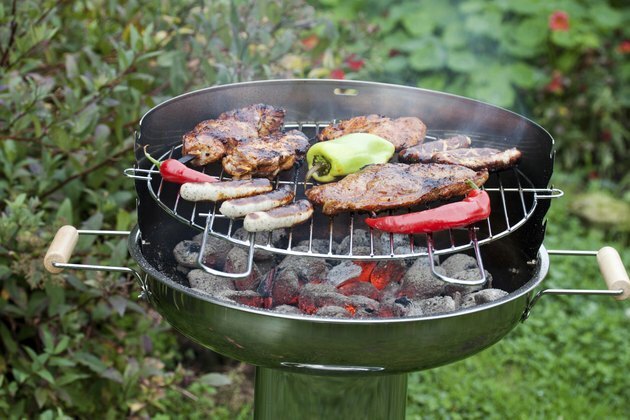 This is because charcoal grills can emit harmful carbon monoxide, soot and particulates into the air. These particles can reduce the amount of available oxygen in your bloodstream, which also can affect oxygen to your baby's cells. Always cook on a charcoal grill in a well-ventilated area and avoid the smoke whenever possible. While the smoke isn't considered as harmful to adults, it can affect your developing fetus, according to Healthy Child Healthy World, a nonprofit organization dedicated to reducing chemical exposure in children. Baby Center: Is It Safe to Eat Barbecued Food During Pregnancy? Baby Center: Is It Safe to Breathe in Wood Smoke From a Fire During Pregnancy? Is Charcoal Cooking a Healthy Option?